north america africa latin america & the carribean europe sturgeon farm. Originally conceived to help remove pressure from wild sturgeon stocks, Mote is developing innovative, environmentally responsible aquaculture techniques to produce a high-value seafood product. For more than 10 years , this process has included the successful construction and operation of commercial-scale recirculating systems, designed for water and energy conservation. Optimal production and processing methods for Siberian sturgeon Percentage of world aquaculture production in Florida also have been developed by region in 2010. Source: FAO State of the and shared with Florida farmers. 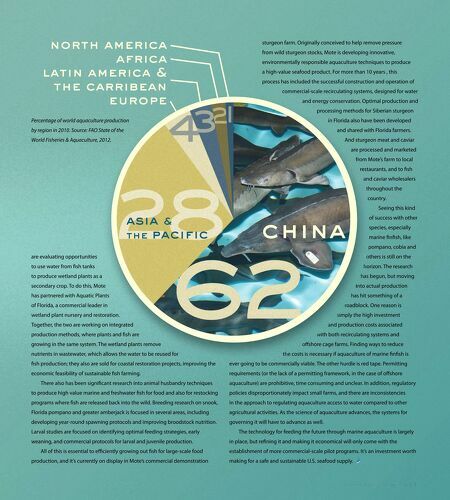 World Fisheries & Aquaculture, 2012. And sturgeon meat and caviar are processed and marketed from Mote's farm to local restaurants, and to fsh and caviar wholesalers throughout the country. Seeing this kind asia & the pacific china of success with other species, especially marine fnfsh, like pompano, cobia and are evaluating opportunities others is still on the to use water from fsh tanks horizon. The research to produce wetland plants as a has begun, but moving secondary crop. To do this, Mote into actual production has partnered with Aquatic Plants has hit something of a of Florida, a commercial leader in roadblock. One reason is wetland plant nursery and restoration. simply the high investment Together, the two are working on integrated production methods, where plants and fsh are growing in the same system. The wetland plants remove nutrients in wastewater, which allows the water to be reused for and production costs associated with both recirculating systems and ofshore cage farms. Finding ways to reduce the costs is necessary if aquaculture of marine fnfsh is fsh production; they also are sold for coastal restoration projects, improving the ever going to be commercially viable. The other hurdle is red tape. Permitting economic feasibility of sustainable fsh farming. requirements (or the lack of a permitting framework, in the case of ofshore There also has been signifcant research into animal husbandry techniques aquaculture) are prohibitive, time consuming and unclear. In addition, regulatory to produce high value marine and freshwater fsh for food and also for restocking policies disproportionately impact small farms, and there are inconsistencies programs where fsh are released back into the wild. Breeding research on snook, in the approach to regulating aquaculture access to water compared to other Florida pompano and greater amberjack is focused in several areas, including agricultural activities. 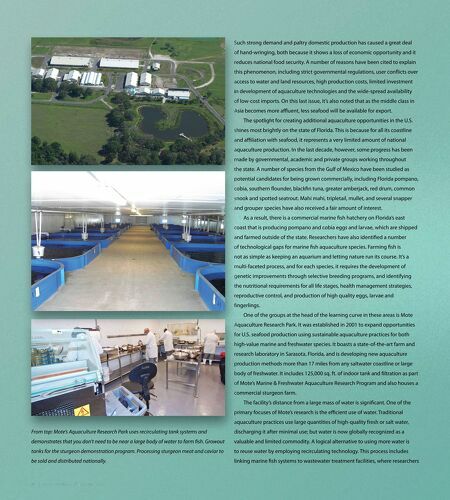 As the science of aquaculture advances, the systems for developing year-round spawning protocols and improving broodstock nutrition. governing it will have to advance as well. Larval studies are focused on identifying optimal feeding strategies, early weaning, and commercial protocols for larval and juvenile production. All of this is essential to efciently growing out fsh for large-scale food production, and it's currently on display in Mote's commercial demonstration The technology for feeding the future through marine aquaculture is largely in place, but refning it and making it economical will only come with the establishment of more commercial-scale pilot programs. It's an investment worth making for a safe and sustainable U.S. seafood supply.